The fun begins at 5pm outside The Crown, Withybed Green with Morris dancing from Aelfgythe and hopefully some visiting sides. 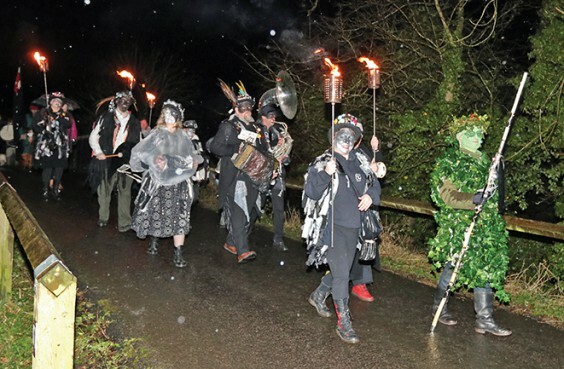 A torchlight procession will set off at 6.30pm in the direction of The Weighbridge, where Alvechurch Community Choir will open the Wassail with a carol, with the Green Man conducting proceedings. Like last year, John Bright’s Regiment of Foote will be on hand to fire several musket volleys to scare away evil spirits and wake up the trees. After everyone has made a lot of noise, with many shouts of “Waes Hael” and the traditional response “Drink Hael”, pieces of toast will be handed out for everyone to hang in the branches. The choir will close with another traditional song, and there may be some more dancing depending on the weather. Organisers want people to join in as much as possible, particularly with the procession and the noisy bits – so bring something such as a football rattle, a whistle, or an old saucepan to bang. There will be a number of electric tea lights in jam jars, and it is hoped that these will be carried in procession by village children. The Weighbridge will have a marquee in the car park so there is shelter if the weather is bad, and there will also be an outside bar so people can get served quickly.